Moak’s Trojan Horse as it resides on Rocky’s campus. On the north side of the Woods Computer Lab stands a horse that shares a resemblance to the Trojan horse. This horse does not move but has snuck its way into the hearts of many. This Trojan horse was created for the Horse of Course fundraiser, which raised money for repairs to the Billings Depot. Artists who wanted to participate had to submit a proposal. If the artist’s proposal was accepted, they would be given a fiberglass horse and $750 to help fund the project. The horses were then displayed at the Billings Depot until they were auctioned off, with the auction money going for the restoration of the depot. Mark Moak, Professor of Art, was one of the lucky people whose proposal was accepted. Moak’s proposal was for the Trojan horse seen today. Moak received the $750 and the basic horse shape for his project. Moak said he put about 263 hours of work into the horse. The horse underneath its metal coat was manufactured of fiberglass, as were all of the other horses in the fundraiser. Most people just used the horse as a canvas for painting, but Moak’s horse was covered in metal because metalworking is his specialty, he said. 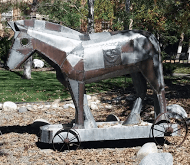 “I wanted to utilize my skill,” said Moak, so he used copper and galvanized steel to cover his horse. Although the Trojan horse in the myth was made of wood, Moak fashioned the look of his horse with metal. The whole project seemed to Moak that it would go very quickly, “like anything relatively clear in your mind,” Moak said. The horse has a steampunk feel with the staccato of the screws and angles, according to Moak. The entire project cost less than $450. A main tool Moak used on the project was a pair of aviation shears, which created the lines that give the horse a steampunk feel. Moak said he chose the Trojan horse look because of his love of classical mythology. “Fantastic and strange and monstrous creatures, heroes, beautiful goddesses, all with super powers, having adventures in exotic places, all stoke your imagination,” Moak said. Moak also said he wanted his experiences to go into the piece, such as his time spent with jewelry work and art history, and even his personal experience in Greece. “When I first took students to Greece, we had an amazing guide named Yannis, who told me if I wanted to understand the Greeks, know the ancient religion,” stated Moak. The horse sculpture originally held two small figures made of clay in the eyes of the horse. The two figures were of Athena and Odysseus. Moak said he placed Odysseus in the horse because Odysseus was the craftsman, like Moak, who conceived the mythical Trojan horse. Moak also said that he placed Athena in the horse because she was Odysseus’s goddess protector and was always helping him with his ideas. The hole through the head of the horse can be seen today, although the clay figures went missing shortly after the horse was moved to Rocky’s campus. At the end of the fundraiser, each horse was auctioned off at the Billings Depot. Moak’s horse sold for the second highest amount of $15,000. Ossie Abrams, former member of the board of trustees and longtime friend of RMC, helped organize the purchase of Moak’s horse by Rocky. When looking at Moak’s horse, the amount of detail put into the metalwork is as riveting as the rivets that hold the horse together. Onlookers can see Moak’s metalworking skills in a way that the horse presents perfectly.